» How about more city taxes? How about more city taxes? 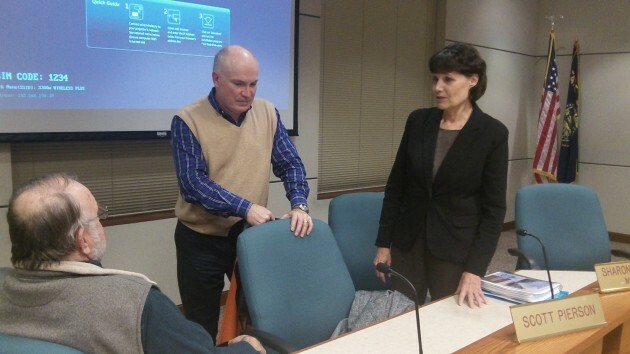 Mayor Sharon Konopa talks with Councilor Floyd Collins, seated, and budget committee member Will Summers Thursday. One of these days, local government may run out of new ideas for getting money out of taxpayers. But that day is not yet here, as the budget committee of the city of Albany is finding out. The committee, comprised of the six council members and the mayor in addition to seven others, this week heard about possible ways in which the city could raise more money for operations. One or more of these options might get consideration as the city’s operating costs — especially in wages and benefits — keep rising faster than its income. Among the ideas outlined for the committee by City Manager Wes Hare and Finance Director Stewart Taylor: Increases in the “privilege taxes” the city collects from the utilities selling electricity and natural gas, both now taxed at 5 percent of revenue from Albany customers. A two-point hike would yield an estimated $928,000 a year from Pacific Power and $260,000 from Northwest Natural. The tax is called what it is because, supposedly, it charges the utilities for the “privilege” of using the public right of way for their wires and pipes. But that’s a thin excuse because it’s the customers and not the shareholders of the utilities who are billed for the tax. It’s more like a tax on the privilege of living in town. The city collects the same kind of tax on water and sewer bills, although it calls this a fee in lieu of a franchise fee — as though water customers had to pay a fee for the publicly owned water system to run pipes under publicly owned streets. The city staff figures that raising this water and sewer tax two points would yield about $420,000. Mayor Sharon Konopa has another idea: She’d like the city to consider a local fuel tax in order finally to start catching up with repairs to city streets. So this, too, along with the other ideas, will be among the options for further consideration when the committee meets again in January to start work on city finances for the 2015-16 budget year. Fee, assessment, tax…….all the same no matter what it’s called. They are all passed on to the consumer (public), ALWAYS…….and the result is less money in our pockets and more in the city coffers. The name matters little. Again, this bunch never saw a tax it didn’t like. This bunch is as “tone deaf” as our Emperor in Chief. The appointed members of the budget committee seem incapable of challenging the bureaucrats and politicians. They seem unmotivated to question the bloated conglomeration of services the city insists it must provide. And they seem unwilling to push back on the grossly inflated wage/salary/benefit packages that are in place. I want less city government, I want lower taxes. I want to keep more of what my family earns. I want the budget committee to be a guard dog, not a poodle to city bureaucrats and politicians. Is this too much to ask? Here in Albany it evidently is. Reduce costs–prioritize to fund only essential services. Negotiate new contracts with caps on medical benefits paid by taxpayers for all union employees. Spend more time doing cuts than trying to get more money. The folks in the budget process are cronies of the paid employees. Come on people you got re-elected to do your job–protect the taxpayer instead of special interests.